Beautiful 5 bedroom home with a large well furnished pool deck, complete with pool and spa, overlooking a conservation area. 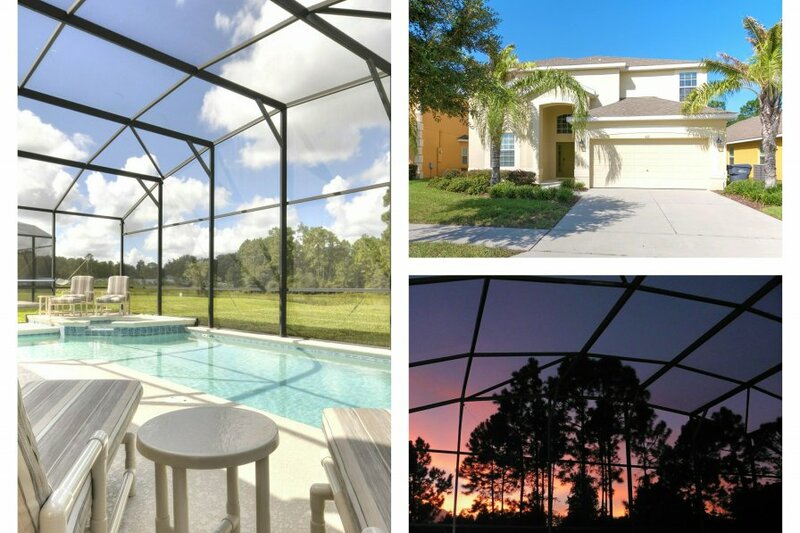 Ideal for a large family wanting a quiet location yet close to Disney. Watersong is a unique and simply beautiful 46 acre resort set in stunning conservation. It creates a tranquil haven that can be much appreciated after busy days at the nearby attractions. There is a large clubhouse with beautiful lounge areas, perfect for larger gatherings, a swimming pool, spa, gym, table tennis, beach volleyball, all available free of charge to our guests. Our elegantly designed and beautifully decorated 5-bedroom vacation home boasts enough space to accommodate a large family, or two smaller ones. Furnished for comfort it offers three separate living spaces and a modern kitchen which is perfect for cooking up culinary delights. The large pool deck overlooks stunning conservation where you can watch the wildlife, soak up the sun and appreciate Florida sunsets. The property is in a quiet location and a short walk from the resort facilities. The open plan ground level living accommodation has two sitting areas and a formal dining area. There is a large flat screen TV in the family sitting area. The well equipped kitchen has a breakfast bar and further seating area that flows on to the large pool deck. Outside there is a covered Lanai forming a comfortable seating and dining area and a heated pool and spa. The master suite is downstairs and overlooks the pool and includes a huge walk in closet. A games room with a pool table and a table tennis table completes the downstairs accommodation. There is a well-equipped laundry area available for our guests to use. Upstairs there are four further bedrooms, 1 King size, 1 Queen and two twin bedrooms. All of the bedrooms have flat screen TVs and the doubles their own private bathrooms. A particular feature upstairs is the large mezzanine containing two huge swivel chairs, a sofa and further flat screen TV. The property is well served with WiFi and cable TV. The property is air conditioned. Baby and toddler equipment are also available.